Abstract: Objective To investigate the effect of ursolic acid(UA) on apoptosis in human renal mesangial cells(RMCs) cultured in a high-glucose medium. Methods After the recovery of RMCs cultured in MCM 4201 medium at 37℃ and 5% CO2, with media being replenished every alternate day, 5-9 generations of cells in the logarithmic phase of growth were selected and divided into a normal glucose group(5.5 mmol·L-1 glucose), high glucose group(30.0 mmol·L-1 glucose), high osmotic group(5.5 mmol·L-1 glucose +24.5 mmol·L-1 mannitol), and treatment A group (30.0 mmol·L-1 glucose+0.5 μmol·L-1 ursolic acid), treatment B group (30.0 mmol·L-1glucose+1.0 μmol·L-1 ursolic acid), treatment C group(30.0 mmol·L-1 glucose+2.0 μmol·L-1 ursolic acid). 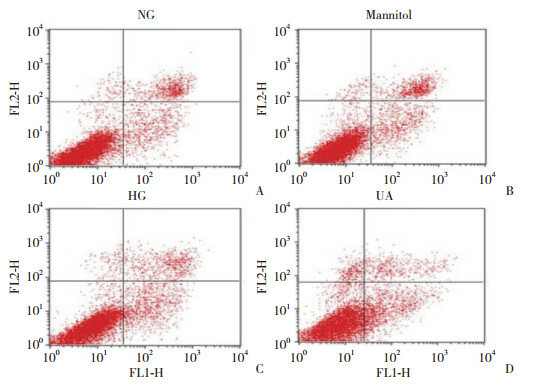 After 48 h of culturing, RMC proliferation was assessed using an MTT assay; apoptosis was assessed via Annexin V-FITC double staining flow cytometry. The expression of Bcl-xl, Bax, survivin, TGF-β1, and FN proteins and mRNA were analyzed via Western blotting and RT-PCR, respectively. 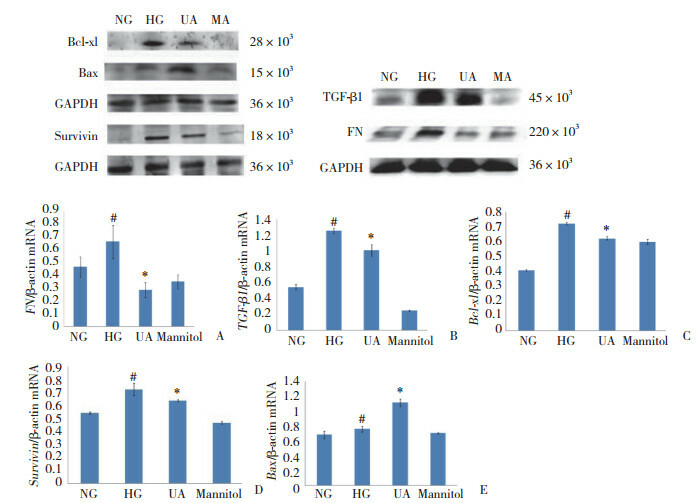 Results UA at 1.0 μmol·L-1 suppressed RMC proliferation and TGF-β1, FN, Bcl-xl, and survivin mRNA and protein expression induced by HG. UA at 1.0 μmol·L-1 promoted apoptosis in RMCs by upregulating Bax mRNA and protein. Conclusion UA can reduce mesangial cell injury by promoting early apoptosis, inhibiting proliferation, downregulating TGF-β1, and FN aggregation. 1) P < 0.05 compared with normal glucose group；2) P < 0.05 compared with high glucose group. NOKI K. Role of mitogen-activated protein kinases as downstream effectors of transforming growth factor-beta in mesangial cell[J]. Kidney Int Suppl, 2000, 77(9): 76-80. 吴斌, 汪旭, 王慧涵, 等. 乌索酸诱导Jurkat细胞凋亡及其机制的初步研究[J]. 中国实验血液学杂志, 2010, 18(1): 61-66. 王琳, 王冠梁, 刘甲寒, 等. 熊果酸通过过氧化物酶增殖受体α和γ信号通路改善KKAy小鼠肝脏胰岛素抵抗的机制[J]. 中西医结合学报, 2012, 10(7): 793-799. 薛记莲, 郑艺花, 邹贵勉, 等. 肾小球系膜细胞及其相关疾病[J]. 中国中西医结合肾病杂志, 2013, 14(10): 930-932.